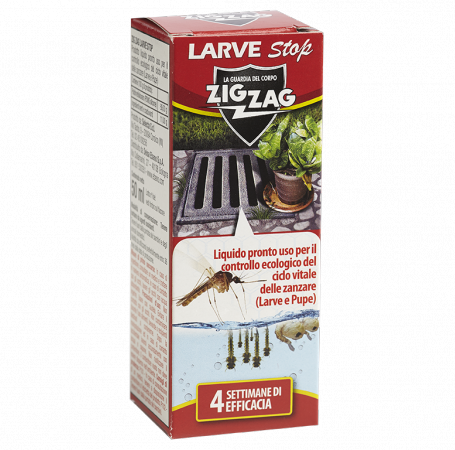 Zig Zag Larvae Stop is a unique product of new generation for the control of mosquito larvae, "eco-friendly" and environmentally friendly. It is easily applied on the surface of stagnant water and without silicone-based liquid product; form a very thin film on thewater surface that covers in all its extension. It acts by physical-mechanical action, with a persistence and efficacy of at least 4 weeks. In accordance with current regulations ZIG ZAG LARVAE STOP is not dangerous to health and has no negative effects on the aquatic environment. It's just 1 ml. of product for 1 square meter of water surface. Therefore a Zig Zag Larvae Stop bottle can treat many more water tanks compared to the packaging of tablets larviciding commonly sold by the competition! It is indicated for use in still water and stagnant: manholes, gutters,drains, sewers, saucers, water tanks, etc. Stop larvae has only an action of physical-mechanical type. The thin silicone film,which is formed on the water surface following the application, prevents the proper development of the immature stages of mosquitoes (larvae and pupae). It does not allow the larvae and pupae to the correct intake of atmospheric oxygen necessary for their development to adult stage, bringing the consequent suffocation. In fact, it prevents larvae and pupae from sticking to the surface of the water to draw from the atmospheric oxygen needed to survive. The low surface tension, also has an impacton spawning in qunto adult females do not lay their eggs on the water treated.